The release of iOS 7.1.1 version came with 3 major updates, but it also contained some small one that will not “change your life” but it will certainly make it a little easier. This small improvement Apple added to the iOS 7.1.1 version is the In-App purchases feature, but we will come back later to it. The In-App purchases feature is not among the major updates, but it is there and it makes things a bit clearer! 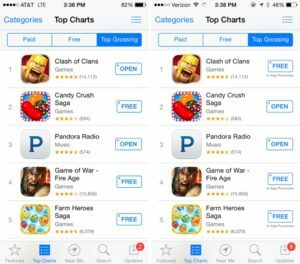 For the moment, the In-App purchases feature is limited to the Featured and Top Charts section of the AppStore. 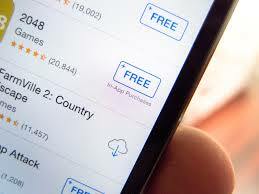 This feature will inform you if there are In-App purchases to the application you are about to download. The text will appear just below the price of the application, and this will help you to instantly understand if you will need to pay MORE, if you really want to have the maximum progress in that game or all the add-ons in a particular application. To be fair, Apple already informed the users if there was an In-App purchase, but you could find that info in the description of the game/app. Few years back, most of applications/games, did not provide such feature, you could paid once and use its full features. Now most people release an application/game, and they keep improving it (nothing wrong with that, but it is better to know in front that you will probably pay a few more bucks!). Not for the moment, but this is definitely within Apple’s plans. Apple and Google are forced to implement certain features, so people can be aware of what they will buy and if more money should be spend on it in order to have full experience! Hopefully, they are both complying to that! Learn how to Install 7.1.1 iOS version via iTunes and not Over The Air (OTA).